Ruth qualified with a Masters degree from the British School of Osteopathy in 2016. Originally working in education and the charity sector, Ruth retrained to pursue her long held interest in the moving body and health care. Her interest originated in her teenage years spent training and competing nationally in Tae Kwon Do, where Osteopathy greatly aided her performance and injury recovery. She divides her work between London and her home town of Bury St Edmunds. As an experienced Sports Massage Therapist, Ruth has worked with a wide variety of patients from office workers, elderly, palliative care, expectant mothers and athletes, working both in clinic and on endurance cycling and running events since 2012. As a part of her training, Ruth worked in the British School of Osteopathy clinic for two years working with many specialist patient groups including; HIV patients, children/adolescents, NHS patients, homeless people and chronic pain patients using a mindfulness and acceptance based approach. Osteopathic treatment is tailored to you as a whole person, not just symptoms. Ruth aims to give patients a clear understanding of their problem and recovery time, and to work collaboratively to find a plan for self care, with advice to take away with you, in addition to any hands on treatment. Ruth can also utilise Medical Acupuncture as a part of her treatment. 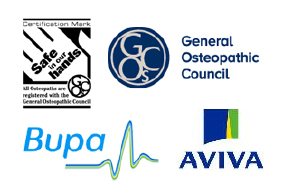 Ruth is registered with the General Osteopathic Council and a member of the Institute of Osteopathy.